France in London | Is France going to lead the energetic field of the UK? Is France going to lead the energetic field of the UK? EDF's takeover of British Energy confirmed on 24 September was first acclaimed by EDF, British Energy and the governments of both countries. However enthusiasm has quickly been followed by scepticism and even fear. Initially, many advantages could be seen from both sides of the Channel but is this still the case? For EDF, this takeover is their biggest international expansion and will give them control of almost all UK nuclear power. “We are delighted that the British Energy board has unanimously accepted this offer,” said Pierre Gadonneix, chairman of EDF. “This paves the way for investment in the UK.” It will place the French group at the heart of the Government's plans for a renaissance of nuclear power generation in Britain. In fact, EDF is planning to build at least four additional nuclear plants in the UK. As far as British Energy is concerned, this is a very good deal since EDF bought it for £12.5 billion. Moreover EDF has a great experience in renovating old nuclear structures: this could come very useful for the UK's energetic field since 8 of the 15 British nuclear plants have to be put out of action between 2014 and 2035. This is why when this takeover was announced, shares of both companies went up. First of all, this takeover will increase the UK's electric production capacity and therefore reduce both the carbon monoxide discharge and the reliance on Russian gas. Great news for the UK! That's why Prime Minister Gordon Brown welcomed the deal: “This deal is good value for the taxpayer and a significant step towards the construction of a new generation of nuclear stations to power the country," he said. "Nuclear is clean, secure and affordable; its expansion is crucial for Britain’s long term energy security, as we reduce our oil dependence and move towards a low carbon future.” Moreover the British government owns 35per cent of the British Energy Funds. In fact UK has a huge backlog in the nuclear field and needs French know how to deal with. And yet UK and France used to be at the same level in the 70’s but then, the Green lobby avoid it to go further in the UK. So France became the nuclear world specialist that UK needs to deal with its old fashioned plants. 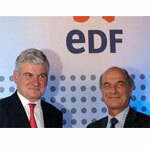 The French government can also be satisfied with the deal since it owns 80 per cent of EDF capital. And on the other hand that is a huge flipside for British people... Their energetic future is going to be lead by a company which is 80 per cent owned by the French government itself. Such a bitter irony since France is traditionally opposed to the setting up of European competition in energetic fields! In fact France doesn’t want to sell its energetic firms to foreign companies but doesn’t care of buying one. British people feel like France doesn’t have any sense of fair play at all. Such a bitterness could be read in the press and tabloids all along the weekend and concerns become manifest: Are the French going to lead British energetic policy? Is Britain going to come under French government’s control for getting electricity? The situation might of course be annoying but there seems nothing serious to worry about. EDF has agreed to sell some British Energy’s nuclear sites to the competition (Bradwell, Dungeness and Centrica are expected), so it will not have the nuclear monopoly in the UK and sufficient competition in the british energy market will be ensured. So as far as customers are concerned, British Energy’s takeover will not mean a decrease in competition or a price increase. A great industrial saga which is worth keeping an eye on.